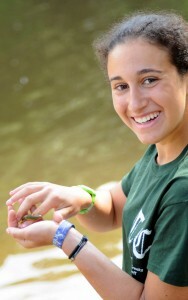 Our Junior Counselor (JC) program is the next progression on camper to staff journey. The vast majority of our Junior Counselors have been campers for multiple years and also completed our Counselor in Training (CIT) program in their final year as a camper. There is nothing we love more than to see our campers finish their time as a camper and begin the next chapter of their camp story as a Junior Counselor. Junior Counselors take on the role of a Cabin Specialist for the majority of their time at camp but are also encouraged to understudy an activity specialist. This allows them to develop strong relationships with their campers while also developing experience in coaching and teaching at camp. 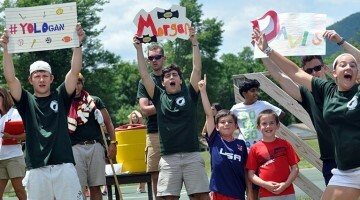 Our Junior Counselors join us for 4 weeks during the summer which allows them to work 2 full sessions of camp. During this time they are provided with a range of support to ensure they are successful and continuing their development into future Camp Twin Creeks leaders! Ability to have hours worked signed off as Student Service Learning hours for High School and College credits. The success of our JC program is paramount to the development of future staff members. As a result we ensure their training and support structures are all encompassing to ensure they are developing into excellent role models for our campers. All Junior Counselors are invited to attend our full week of Leadership Training before the summer. This week is a vital opportunity to learn about child welfare, develop relationships with staff and engage in meaningful discussions and debate on our educational staff content. During the summer, our Director of Junior Counselors meets with JC’s once a week as a group and also coordinates additional individual training sessions if requested. The Director also provides formal and informal feedback and evaluation sessions for each individual to assess their progress. If you are interested in joining our staff as a Junior Counselor we encourage you to apply here. Our Junior Counselor Director will then be in touch via e-mail to coordinate a time to discuss your application.